In the fourteenth episode of the Mindfulness & Grief Podcast, I interview Jan Warner, author of Grief Day by Day: Simple Practices and Daily Guidance for Living With Loss. During this episode, Jan shares how her deep love for her husband Artie lives on, how to deal with people who just don't understand, and how Grief Day by Day can help you become your own "grief whisperer." What I love about this interview with Jan is her honest and unfiltered view of life after loss that balances the reality of the pain of loss with the love and levity that helps you continue to live on - with their memory right by your side. The book itself is a fantastic resource - easy to read and offered in small, daily bites that will help you take the next best step for you. When my husband died I thought I would sadly miss him. Instead I was devastated. After the first chaotic year I began to rebuild my life by honoring him. I became available to grieving people the way he, as a recovering alcoholic, was available to alcoholics and addicts. I wrote a blog. Five years ago, I started a FB page, Grief Speaks Out at www.Facebook.com/GriefSpeaksOut. It is a loving, supportive international community of 2.4 million people. My book, Grief Day By Day: Simple Practices and Daily Guidance for Living With Loss has been called a soothing balm for a wound and an outstretched hand in friendship. I have a Master's in Counseling Degree and have studied NLP, and hypnotherapy. In becoming fully alive with grief I have produced documentary films and an off-Broadway play. I’m a vagabond who has been to all seven continents. I love being a grandmother. I hope you enjoy this episode and welcome your feedback and reviews on iTunes, Google Play, Stitcher, iHeartRadio and YouTube. Subscribing, rating or reviewing the podcast will help it become more visible so others can benefit from these teachings. Heather Stang 00:04 The Mindfulness & Grief podcast offers compassionate insights for coping with grief and life after loss. I'm Heather Stag, author of the Mindfulness & Grief book, and your host for this podcast. Heather Stang: 00:22 Welcome today we have as our guest Jan Warner. I read her bio and instantly fell in love with her because I could tell she's a real authentic griever. She's not one to necessarily take the pithy advice that people give her, but she trusts her own internal compass as to what's right for her and so I think she's absolutely perfect for the Mindfulness & Grief podcasts since we're trying to find our way through grief rather than grieving the way other people tell us. 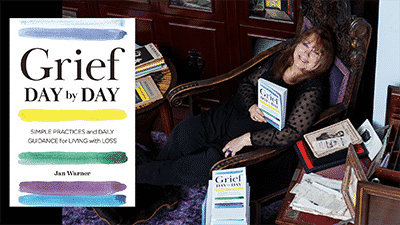 So Jan is the author of the book, Grief Day by Day by Jan Warner, which you can see on the screen and you'll be able to find the link to in the show notes, and I'd like to just start by welcoming Jan to our podcast. So welcome Jan.
Jan Warner: 01:18 Well thank you and thank you for your kInd words about me and about the book. I appreciate them. Jan Warner: 01:37 My husband Artie, who everybody wants to know about him and it's interesting because they feel like they know him even if they never met him. He was a rough and tumble kind of guy and we loved each other but we also fought. So we were that perfect relationship in the sense that when somebody loves you at your best it's okay, but when they love you at your absolute worst, it's amazing. And he was 21 years older than I was. He lied to me about his age when I first met him. So I thought that when he died I would feel sad and I would miss him. I had no idea. I would feel totally annihilated, like I had died with him and then it would be such a struggle to start rebuilding myself. So grief was not what I imagined it would be when I thought about it. Heather Stang: 02:40 Yeah. And, and from what I've heard from so many spouses and you know, I'm always upfront, I haven't lost a spouse yet or somebody in this relationship hasn't yet, but that, you know, even people who are grief professionals, or you're a counselor, it doesn't matter what you know up here, it's just going to be this messy, unexpected experience. And so for you in the early days of that loss, and I'm curious throughout your loss history, but in the early days, what, what did you try? What worked, what didn't work? What clashed with your beliefs? Jan Warner: 03:21 Everything! [laughs] I shouldn't laugh. The early days were just chaotic. They were crazy. I would be talking to somebody about something simple, like I'm packing a box to move to New York City because we live together in Carmel, California. But I wanted to move to New York City as soon as I could. and I would start crying hysterically. I felt that I was much more, I might not have been, but I was much more open to my sadness than people in bereavement groups that I went to. And it was a therapist that got me started on this because she's a very sweet, wonderful, loving person, but she told me that my grief should be over in six months to a year, or that I had something called complicated grief and I thought that was the most foolish thing I ever heard of that because I love my husband. Jan Warner: 04:18 I didn't understand that idea that I would even want to stop loving him. So from the very beginning it was finding people that would validate my idea that you could be fully alive with grief if you want to ask to be released from grief, that's okay. But when somebody is central to your life, my experience has been that you grieve for them until the day you die. I have explained to therapists that I've gone to that it's a recurring trauma. It's been nine years and I often wake up in the morning and look around and go, still dead. Okay, now what do I did? As a matter of fact, when I was walking in to do the interview, I thought, okay, I know you had died, but come on, come with me. I need you. Its a different kind of thing, but I literally traveled all over the world. Richard Bandler who started neuro-linguistic programming. he did a small workshop and I went there. I went anywhere where anybody was doing any kind of work that I felt like could help me save my life. Heather Stang: 05:21 Can you say more about neuro-linguistic programming? Jan Warner: 05:24 Yes. Neuro-linguistic programming. I wish I had a good description for it. It's about training your brain to think in different ways, but it's not straightforward talking. I could tell you every day that I'm sad that my husband's dead, but that's not going to create change. So neuro linguistic programming is a way of changing how you think, changing how you move, setting up exercises that actually create changes as if your brain was a computer. Heather Stang: 06:00 It is, isn't it? I mean, it's very plastic. Jan Warner: 06:04 And I decided with the book and all the other things I do that it's time to go back for therapy touch up. And I looked for somebody that does hypnotherapy and nlp because I don't want to talk about it. I want somebody to set up things for me that are going to create change. Heather Stang: 06:23 Well, just a couple things that you've said in there. I think are really, really interesting and really helpful. One is just talking about complicated grief, which every year at the Association of Death Educators and Counselors conference, there is a huge debate on this. It is a highly controversial subject and my sense is that the majority of members of our association, if I dare say that because I don't know this for a fact, have a lot of skepticism around that because exactly what you said. You love your husband deeply. It does not go away in six months or a year or two years or 10 years. It is not a time bound thing, but you also mentioned the being able to live your life fully with grief, and that's that mindfulness piece where you can have the sadness, the heartache, and the love and the memory. So for you personally, how do you weave, and I don't know for you if it's conscious or unconscious, and I feel like it might be tied to this neuro-linguistic programming, which I know it a tiny bit about - probably enough to be dangerous and sound smart - but someone who would know would know that, no, she doesn't quite get it, but for you on it, for the people who are listening, who are, you know, husbands, wives, partners who are trying to figure out how do I navigate this loss and live my life? What has, what wisdom do you have to share about how you get through day by day? Jan Warner: 07:59 For me, it's the connection between love and grief. I saw a play where a man was crying at his wife's funeral, and everybody thought he was crying because she died, but he was crying because he didn't grieve for her at all. And he thought that he deserved to have loved somebody enough to have grief. And I walked out of there thinking for the first time that maybe this actually was a gift because I had this wonderful love. So whether you have a miscarriage and you've lost the baby that you wanted to have, that you haven't met or you've been in a relationship for 50 years, it doesn't matter. It's, it's love and hopes and dreams. And then the part that goes with that is at some point. And this was after four years, so it wasn't immediately, it was my husband's life should matter more to me than his death. Jan Warner: 09:05 We had such a wonderful time together. He did all this work to help other people. He was recovering alcoholic that sponsored a lot of people in the work with them. Why am I always thinking about him, as dead Artie? Why aren't I thinking about him as live Artie? Why do I not reclaim my memories and rejoice in that? And for me, it's a balance because I will collapse. People say you shouldn't wallow in self pity. I love wallowing in self pity, I just don't want to do it for the whole day. If I need to do for the whole day, I do, but I try and time limit it. But, the grief is because of the love and I'm very lucky that I had that love. Have that love. Heather Stang: 09:48 Wow. And what a deep love you have. I mean, I noticed it in your book, and I mentioned to you that I started reading your book recently and just for those of you who are listening, if you do pick up this book, what I thought was incredibly special about it is that you pull out quotes that people have said about grief and then you offer your, your input, your wisdom, your viewpoint of it. In a really, you know, grief isn't funny, but sometimes, our experience is because we're grieving, there can be some - I don't know, some weighty humor to it. And I don't want to say it's by no means like a book one laughs through, but we can recognize ourselves in some of the, the experiences that you have. And I think that that's very healing, so it's both this really serious, weighty book about the biggest challenge any of us will face in our life with just that day to day with - I don't know - wisdom, that's the word that comes to me and I might be rambling a bit because I really felt this book was fantastic. It's done in pithy pieces - that's a word we use in meditation a lot - little thoughts. And when you're grieving it's very hard to read. And so it's a day, it literally is day by day, week by week, and you only have a little bit that you have to read. Although I've been sneaking ahead and going further, and you can kind of carry that with you. And so since I've brought in that idea of humor in there, because I know that you've produced a Broadway play and you've been in this theatrical world, how does humor play in to, to dealing with the sadness that comes with grief? Jan Warner: 11:42 Well, somebody asked me once a question that I thought was really good. He said, do you joke with your dead? And I do. And humor has always been a part of my life. I have two things that for me help a lot. One is showing up for things in the hopes that I will enjoy them, whether I want to go or not. And the other one is helping other people. And when my husband first died and I came to New York, I knew I loved theater, and I slept through everything. I even slept through Hugh Jackman and Daniel Craig, which I kind of wish I hadn't. And then I saw Carrie Fisher and there was a part in Wishful Drinking where she calls on an audience member and she called on me. And not only did I stay awake, I laughed and she gave me a little medal on a ribbon at the end, which I still have because it was, "wait a minute, I can still laugh." Jan Warner: 12:39 And then the bereavement groups and the things we talked about at the beginning, the therapy, everything was too sad. So I took a course in comedy sketch writing and the teacher said, why are you all here? And everybody said, meh, and I said, "well, my husband died so I thought I do comedy." So like when the humor is gone, I feed it and and I'll go on Facebook and look for funny things. If my humor gets lost, it's like, well bring it back in. Heather Stang: 13:06 I pulled some quotes from your book, which I actually realized about five minutes in that I was just going to be retyping your book as I was pulling out quotes because there are so many good ones. And one thing you said is that you've redefined joy. And you know, that's something that comes up a lot. In fact, recently in my online bereavement group, somebody put their intention was to find their joy again and, and then this word, the sentence you wrote came up, "I have redefined joy." So talk to us about what is your vision of joy, now. Jan Warner: 13:47 I don't mind holding at all. So I'm always sad because my husband's not here, but I can be happy at the same time. So there wasn't, before he died I had the anger because I don't believe there are negative emotions. I think that they're all there for a reason. The Dalai Lama said that I get angry but I don't hate, which means he doesn't hold onto it. So what I've been saying lately is "who am I to be more spiritual than the Dalai Lama, if he gets angry I can get angry too." But it's like a huge layer cake. There's all different ways that you can describe it so I can be happy. I'm not betraying my husband if I'm laughing and I'm also not betraying him if I'm sad, but I can do it all at the same time and every once in a while there are moments of pure joy where I'm totally present to joy, but they're not as often as they were at the beginning. Heather Stang: 14:51 What are some of those moments for you? Jan Warner: 14:53 A lot comes to my granddaughter. My granddaughter was born two years after my husband died and when my daughter was pregnant I wasn't sure if I could love another human being, if I had room for it, but I also felt like a child needs you to be 100% present with them. So there are moments where we're like wrestling on the floor or she says something totally amazing where it's just that crystal clear joy. Also the way the book is set up, they gave me an outline. I didn't, I didn't make up the outline. There's 52 topics and I made every fifth topic a resting place because when I'm writing about despair or anger or confusion or people who you thought were your friends leaving you, my editor often said, could you be more encouraging here? Could you cheer this up? Jan Warner: 15:47 And I said no, but under the section of hope, faith. but those kind of things is to be aware of those. And that's mindfulness to me, is to look around the room and say, what am I seeing that's beautiful right now? Don't block out everything. Don't let grief be a blindfold. Let it be. That's part of the - I developed that phrase "becoming a grief whisper." It's like I'm in a lot of pain right now. I acknowledged the pain, but let me look somewhere else to see if I can let the beauty in too. Heather Stang: 16:24 Yeah, I'm glad you brought up grief whisperer because that's woven throughout the book and so can you share what a grief whisper is to you and maybe even a couple pieces of wisdom on how we can become our own grief whisperer. Jan Warner: 16:41 Well, I knew about the phrase like being a dog whisperer or horse whisper that you had this animal that you trained and for some reason I often picture on my Facebook page, grief is a huge dragon. So how do you tame this beast that's rightfully in some ways taken over your life in your own time when you're ready?" Jan Warner: 17:05 And I had to do one exercise for each week and they just, I don't know what they wanted me to call it, but I said becoming a grief whisperer and they said it's going to be grief whisperer exercise. And I said, no, it's going to be becoming a grief whisperer because even if you never do any of the exercises, every time you read becoming a grief whisperer, that's an NLP thing. You're giving yourself the message that you are becoming. My grief - It makes me very comfortable in bed, covered with blankets, never wanting to go anywhere. My grief makes me wanna cry and curse and yell and stay stuck in that black hole. So as I tame it, I can say things like, okay, right now I'm going to this thing. Don't hold me back. I'm going to the theater. I'm going to a party. I'm going to do an interview. I can do it and I'll come back to you later, because I feel like emotions are like small children. If you ignore them completely that they get louder. There's one exercise in the book that I modified in order to do it in public. When you see something, I was at the theater and I saw a man put a sweater on his wife shoulders, and it was just like - it was such a loving gesture. So you look down and you acknowledged the pain. "Oh, that really hurts." And then you look up and you notice every detail around you. Somebody wearing red, a car just went by, and then if you still feel the pain after being firmly rooted in the present by being observant, look down again and say this still hurts, and then you look up again. So that's what I mean. Learning different techniques. One of the biggest difference between the first six months and now is that even though sometimes I still fall apart, I have a lot of tools in my tool belt to help me say to my grief, come on now, be my friend, don't be my enemy. Heather Stang: 19:16 That is such a radical act of self compassion to be able to turn towards the pain and say exactly what you said, ow, this hurts. And then rather than shoving it down, trying to pretend it doesn't hurt, or basically riding the dragon even though you're in the theater, you're back to the grounding yourself in the present. You're being with the pain, but you're also being present. Jan Warner: 19:44 And not feel bad if I can't, because sometimes you're just there. That's where I say the most important thing is, is that wherever you are is okay. Heather Stang: 19:55 Absolutely, and I've talked to so many people and I'm sure you know, you have too, where the biggest challenge in grieving is the negative self talk, that I shouldn't be feeling this way or I need to be able to walk through the grocery store and not have a meltdown. Who cares? You know, I know that we do have those social things, but it's grief and your grief is often bigger than maybe walking down the cereal aisle and sometimes it does need tending to a in unexpected moments. We can learn to emotionally regulate as well, but it's about also giving yourself permission to be exactly how you want to be. How you are. Jan Warner: 20:41 It helps to know, when I started my Facebook page, I just remember trying to get the first 100 likes. I never imagined I'd have 2.4 million likes from all over the world, but everybody has that in common. Somebody told me that it gets worse during the fifth year. That helped me to know because during the fifth year I started getting really sad and melancholy again and to know that that happens in India, in Algeria, in South Africa, grief is really a common language that cuts across all cultures and you could be religious, you can be an atheist, if it hits you because it's exhausting. In 20 years you have gone through living without the person that you love or the people or the animals for 20 years and it, it takes a toll. So I just, you know, here she goes again, but what do I want to do? Heather Stang: 22:18 And because grief is so unique to each individual person, even though there are certain things we see rise up often, like everybody's experience is so very different. There's a lot to it as well. And so I love that reframing of the idea of normal to "is this serving me." Jan Warner: 22:43 You have to listen to people and that's why a great speaks out. You're not allowed to give people advice, you just share your own experience because I can't really know what the best thing is for you. I can just share what worked for me and then you can pick out of that grab bag what fits for you. And that comes also from that alcoholics anonymous, from wanting to continue my husband's work in my own way by making myself available to grieving people the way he made himself available to alcoholics and addicts. Jan Warner: 23:18 Yeah. So almost like a Grief Anonymous in a way, not that it's the same format, but it's a safe space to say your truth and get support. and so tell us a little more about your amazing Facebook page with this huge community because one of the things that, that I know, not only through the research I've read, but just through talking to people and my own grief journey, social support, having other people by your side, whether it's virtually, whether it's professional, whether it's a group of friends, is one of those things that can help us live the life that we want to live even as we carry a loss. Jan Warner: 24:01 The nIce thing about facebook is that you can do it in your pajamas in bed. So if you're at a point in your life where you're isolated and you don't want to have human contact, you can still be parts of different communities. I considered suicide myself for the first six months because I thought my husband would go, was gonna come and get me. And I couldn't believe. He didn't because, I mean, how could he just go away and not come and get me? And then I thought, well, if I have a really good wife, I'll go be with him. That's what I... And then I couldn't, I couldn't do that to people because when you were in so much pain and you choose to take your life, it creates pain in others. So then I was like, what am I going to do? And I thought I can honor him, which I think is a really important thing. Jan Warner: 24:58 A lot of people that are looking for a way out or a way out temporarily can find it by honoring the person that they love who died in some way, because if I'm going to remember my husband, I want everybody to remember, nobody's going to forget my husband. So, I started a blog, and I thought if I reach one person, that's enough. And then somebody said, you have to start a Facebook page. So I filled in what I needed to and she said, I liked your page. And I said, oh, now I need to put something on it. And part of it I think is what I've been told a lot as I articulate what a lot of people feel, but they don't know how to say. But also I give people seven posts a day so they can get up in the morning and drink coffee and know that I'll be there. Jan Warner: 25:53 I ask a question of a day. I don't allow any preaching or judgment or telling people what to do. And so people feel safe to say anythIng. One of my questions that I asked sometimes is, what's the craziest thing that you've ever done? Remember, you're on Facebook and this is an open page and people will say things. Mine was, I'm making that face. Mine was that my husband's ashes are in the original plastic bag that they brought it to me and which I did not put in an urn. I put it in a pillow that's on my bed. And I thought when I told people that they would run screaming away. Instead, I found that there are a lot of people that have ashes of their loved one in a plastic bag on a pillow in their bed, or if you keep the room exactly the same or if you gave away everything the next day, whatever it is, somebody else out there has done the same thing because we're trying to cope with things that we can't possibly cope with. Heather Stang: 26:58 And as many books as there are on grief and as much wonderful research has been done, it's really finding your way in which might to you seem strange, you know? I know defInitely I've had situations where loved ones have died where I'm like, gosh, this is weird I'm doing this, but it seems like the right thing to do. It brings me comfort in that. As you said, you, you know, in my line of work I talked to, of course a lot of people who are grieving and I'll hear them say they did that and I'll be like, yeah, yes. That that just seemed like the right thing at the time or, or it was the right thing for me and maybe even that word right, I think is a tricky one with grief for me. Is there a right or wrong? As long as you're not causing harm to yourself or others, it's what goes back to what you said and what I often say. It's like, am I reducing the suffering in my life? Am I helping myself continue to live my life? Am I honoring my loved one whose relationship is still very much alive right now with me? Sadly, they're not right here, but I have conversations with my stepfather and my uncle on a daily basis. Sometimes my grandfather, just different people and you know, I mean my uncle's been dead for 40 years and he and I still converse pretty regularly. Jan Warner: 28:30 Yeah, that's exactly right. People often say that they know now that they're not crazy because they think that they're crazy and grief can cause PTSD, it can cause depression, but that's not what grieving is. Grief is a thing of its own and we do the same thing in our family. My granddaughter and I were bouncing a ball in the living room and it was going and all these weird directions and she looked at me and she said, oh, I bet grandpa already is playing. Not every family would be comfortable with that, but we have a dead family and a living family and they both love us. Heather Stang: 29:12 And that's a beautiful way to weave his story into her life so she'll still benefit from his life and from... he sounds like he just did really amazing work with other people that does not need to stop. You know, it can carry on through you. It can carry on through her. And I love that you're that kind of grandma. Jan Warner: 29:36 I feel that way. I feel like he's, he's pulling my hand and guiding me and I'm lucky that I have friends that understand. I was with a woman friend and she was saying how she feels like she knows him and so many other people do. As I said before, and it's because of me, and I looked at her and I said, take it for what you will, but he just said, I should tell you, it's because he's so charismatic. I shouldn't take all the credit. Did he really say that to me? I don't know. It felt like it, but it was nice that she dIdn't say that I was hallucinating or anything like that. She just laughed. Heather Stang: 30:16 So we're bringing up that idea of feeling like you're going crazy when you're grieving, but that it's actually a natural, a very natural event. And you know, part of what I loved about the tone of your book was just that honesty that you kind of felt that way and then you realized you're not, and then you're able to share that with other people. You're not necessarily listening to what other people tell you. And so what advice do you have for people who are being given advice by all sorts of people that may not be correct. You know, and this can even happen in a therapeutic relationship, or friends who are saying, you should do this. You should do that, you know what, what is, how can you offer permission, or what do you normally say to people who are like, well, so and so told me to do this. Jan Warner: 31:07 It depends again on who you are. I'm very outspoken. I have a mean question, and I will say this is a very mean question, that I will sometimes say to people, which is simply: if the phone rang and the message was your husband, your daughter, your sister, whoever was just killed in a car accident, when would you stop missing them? And I've had grown men cry because people don't. It brings it home to them? But that's not necessarily something I would recommend that other people do. Sometimes it's easier just to go. Thank you for caring. I tend to be more about educating people about grief. So I will say if you meet some people that, like you said, 40 years where they're talking about somebody who died a long time ago, instead of saying you're stuck, or you should get out more, or you should have a life, why don't you say to them, what do you miss about that person? Because then you're opening a door and when they tell you all the things they missed doing with that person, you're going to understand. Plus you're going to give them the great gift of just having them listen to you. What I say to people now myself is whatever would be most helpful for me to say, pretend I just said it. Because what I hate might really be helpful to you. So it's that thing again. Listen, listen, listen. Instead of talk, talk, talk. Heather Stang: 32:39 So important. And Educating the people who maybe haven't had a major loss yet. I think in a kind, loving way, might help them cope with their own loss later. Because I find a lot of times the people who say unhelpful things or people who haven't had to go through it yet, you know, I even wonder, I mean, granted I was, I was, my first major loss was when I was seven, so most of my life I've known what grief was, but I still kind of wonder, you know, were there, have there been times in my life where maybe I've said something unskillful because I was a little distant or you know, from, from my own loss and, and it wasn't what I focused on the way it is now and I didn't have my mindfulness practice, but oh, whatever. Maybe I did, maybe I didn't. I'm going to forgive whoever, whoever I was then and move on. But, but, you know, whenever we encounter those people who just say those hurtful things, they're another human being across from us. Jan Warner: 33:39 That's why I think silence is also okay because it depends. When I think every griever has this story. I thought I had this very clever response when people asked me how I was doing. I said, I'm okay with not being okay, and this very sweet women three weeks after he died, said, still? And I said yes still. And then of course I went and said, how could you know, how are you asking a stupid question like still? So it depends how, what your emotional makeup is, whether you can just smile and say yes, still, thank you for caring. Or if you just like, have to resist the urge, to smack them upside the head, I do not recommend that response, but sometImes it's an emotional like to go home and go, that hurt, you know, to build a shield around yourself so that when people say things. My favorite one was said to me in Greece, the country, Greece, somebody said, your grief is so new, and this was after about four or five years. So they realized that it was new every day. And then I had for a charity thing I got to have lunch with Issac Meserani who is amazing. And he looked at me, he said, you're so lucky. And I said, why? He said, well, first you got to spend all this time with somebody who you love, who loved you, and now you're grieving for them. So many people, when someone in their life dies, they go, oh, thank goodness. Now I don't have to deal with them anymore, and that was, I hadn't heard that, and this was nine years in, and he again put a different perspective on it that there are actually close people to me who I don't grieve for at all. So the fact that I'm grieving, it's a stretch at the beginning, is something that I can be for as well as resentful for it. It's that holding, and again, somebody asked me to answer a question, how do I grieve without becoming a bitter and resentful person? And my answer was, there's nothing wrong with bitter, if you remember the sweet, and there's nothing wrong with resentment, if you remember the gratitude, so you know, be willing to go back and forth. Heather Stang: 35:59 It's all about balance and wholeness and fullness, which this life is certainly a mixed bag of feelings. Nobody's given you will have, you know, a blessed, happy life. Very few people get that. Even if we go back to the Buddha's story, you know, which was all about them, keeping him happy, he had that longing to see what else is there in pretty much every hero's journey has that has that tale and so it's what do we do with it after it happens. Jan Warner: 36:34 And you'll notice in my book the last two topics are acceptance and healing and they both have question marks after them. And that question mark is very important because some people feel that they have totally accepted, and some people feel that they are healed. I'm not delusional. I know my husband's dead, but there's part of me that still expects him to come back, even though he can't. And I will always be healing. I won't, I don't think I'll be healed until I'm dead because that's just not who I am. So again, wherever you fall is okay. There's a person that was widowed about the same time. I was, and she's just fallen in love and I'm totally happy for her and supportive. That's not my route. We all just sort of take whatever route we take. Heather Stang: 37:25 So let's talk a little bit more about, about the book and the structure of the book. Because as you've mentioned before, it's 52 themes. Each theme gets, is has a week devoted to it. it's not necessarily bound to a particular time of year though. You could pick the book up today and start your 52 weeks today. Or you could wait until maybe an anniversary or whatever you decide to do. And then there's, there's kind of a, I'm calling them devotionals. I know that might have a religious connotation to it and that's not what I mean, but just a contemplation for each day. How did you determine the flow of that? Did you get to determine the flow of that or was that directed? You know, because I did, I did think that there's an arc there, a little bit. Not that everybody's grief trajectory looks the same. We know that. But what was your thought process in terms of structuring the book? Jan Warner: 38:25 Well, it was suggested to me that they're be an arc, so I'm not sure how careful I was about that. And it's a book where you have a choice. Some people start at the beginning and read all the way through and do the exercises for each week, etc. and so forth. Other people just go, I need to read something about hope. I'm going to look at the Hope part. I am really feeling sad because one of my friends stopped speaking to me. I'm going to read the section about that. So it's also something - because I always say my attention span died with my husband - that you can follow the structure or you can just do it however you want. It's also a good thing for discussions. I was talking to a friend whose husband does not like talking about grief, but she'll be reading something in the book and she'll say, will you listen to this quote and what Jan says about it, and then he starts talking about it. Jan Warner: 39:24 So you have a choice to make it fit yourself. I developed the idea of the resting places because I am blunt, and I am honest, and I didn't want it to be a book that you had to put down and never pick up again because you were just crying through the whole thing. Because that's part of becoming a grief whisper is to say, here's all the painful parts and here's the parts of life. I call it decorating the waiting room. I'm waiting to be with my husband, but if I'm here it's for a reason and I might as well make the waiting room full of fun and joy and as much life as I can, but the goal is, as my husband used to say, we only have moments. It's to increase the number of joyful and productive moments. My goal is never to be perfectly balanced and functioning. I bought a - it's not even a quote I don't think in the book - I bought a plaque in those first couple of weeks. It said have an adequate day, and I went, I could do that. Jan Warner: 40:25 Have a happy day to day, but I think I can have an adequate. I'm glad you brought that up because when I was talking about your book being funny earlier and I couldn't quite remember like what a specific thing is, but over here in my notes I actually see my "Have an adequate day." Like that is the type of humor that's also rooted in so much truth, because I often talk about how when we are grieving. It's not even about getting from sad to happy. It might be about getting from sad to like neutralish, to sad to maybe holding some sadness and having some spaciousness at the same time, and so have an adequate day is perhaps the bumper sticker that pretty much every grieving person might really appreciate because if you can just make it through the day, sometimes that in and of itself is the victory. Jan Warner: 41:22 That's the bottom line. Breathing is enough. I know that there's something in the book about movement, in terms of self care and what I say I'm going to ask you to move. If you want to go outside and run, that's fine. If you don't want to, see if you can move your little finger up and now you take the smallest, smallest step and if you can't, taking a shower. It took me a long time before I could enjoy taking a shower. I took a shower because I mean I didn't want to just be totally gross, but to actually enjoy. That's mindfulness, to to enjoy the water. What it feels like. And to enjoy being clean. Some of that stuff takes time. So one of the things I think in terms of taking care of yourself is just giving yourself infinite patience and saying, I was doing really great yesterday and today I don't feel like I can move. Okay. Let's see when I can move. Maybe it'll be an hour. Maybe it'll be in a half hour. Maybe it'll be tomorrow. Make it easier instead. I mean I can't, I look at my calendar. I can't do all these interviews. I can't meet all these people, but I can look at what I have to do today and turn on my computer at 2:00 PM and have this lovely conversation with you because I would have lost so much if I hadn't done it, if I had been too afraid to do it. So that's my other thing is always being frightened or nervous doesn't stop me from doing anything. Heather Stang: 42:59 You are the warrior. You dedicated the book to grief warriors out there, which so many of us are not by choice. We talk about this, this comes up at TAPS gatherings a lot, which is for military loss, where people say, you know, everybody tells me how brave I am. I'm not choosing to be brave and courageous. I just have to get up every day, you know, because the alternative isn't acceptable. And so, you know, we are warriors without often proper training. Who can train for this? Regardless, and it can take a lot of willfulness. Jan Warner: 43:42 And it could be, I mean the things that I've accomplished in the past nine years or rather astounding to me anyway, but those first six months, the fact that I stayed alive, that was a really big thing. That was a difficult, difficult thing. That's why they wanted to call the section considering suicide, contemplating the end. And I went, no, no, no. People that are thinking about suicide are not contemplating the end, they're on the internet trying to figure out where they can buy bullets, this needs to be addressed. What is the reason that I'm going to stay alive? And for some people it's for their pets or their other children. Some people it's for themselves. Some people it's their faith. So it's always what's the hook to hang onto? Actually, that's a bad word. Tomorrow because I can't see around the corner and I don't know that I'm going to meet this wonderful person or have this wonderful granddaughter or have this magical experience if I allow myself to do that. Heather Stang: 44:55 Right. I'm really glad that you address that in the book because I think so often it just gets skirted over, you know, and we're, it's a very real feeling for many people and I think particularly for spouses to, to think about that and to be able to actually address it and talk about it and have resources to get help for it, or whatever is incredible. Again, my, my uncle died by suicide, so I thank you for addressing that in your book. And I wish more grief books did address it. I wish - come to think of it - I wish mine addressed it. You know, I think I think I might have a couple lines in there because you don't get a ton of space, but you think it's a really important, aspect that just can get glossed over. Jan Warner: 45:47 People are afraid to think about that. But they're also afraid there's some people you can't stop. When Anthony Bourdain took his life, people were all, well call suicide prevention if you're struggling. And I was wondering, here's a man who's very successful, is staying in a five star French hotel, has every comfort in the world. What would somebody at a suicide prevention hotline have said to him that would have changed his mind? I probably would have used his daughter as a hook to try, and I'm going to use hook for that, to really grab them. But people that choose to take their own lives are thinking about it by mentioning it to them. I've had suicide prevention training in London and in San Francisco, so I'm not making this up. You need to ask, you know, are you thinking about killing yourself? Do you have a plan if your plan is pills or a gun, are you willing to give that to me? But then it calls for you to do something. But I think that's one of the saddest things for people, especially, I don't know, I was gonna say, especially children, but I don't really compare a grief because you always have that question, what could I have done to make this person feel less pain? And the answer might be nothing. It's a very difficult thing and I think it needs to be addressed head on. Heather Stang: 47:27 I don't know if, you know, I used to work a suicide hotline actually did for seven years and you know, and, and I think it's an interesting question. It's one that certainly has come up a lot. Sometimes, yeah, you can't when you're talking to someone, you might not be able to convince them mentally to stop, nor maybe is that the most skillful way - you might have to send intervention physically stopped. But one thing I know from doing that type of work is that the whole fact that people are, that there can be this culture around not talking about it if you think about it because somebody might freak out, that's our big problem. It's fear is the mind killer. Fear can also be the, you know, can be lethal if people don't feel comfortable talking about it. And so with, you know, it is sad. We've had so many celebrity people die by suicide lately. I don't ever think of grief or death is like a gift gift, but I'm glad it's starting a conversation in a different way. Jan Warner: 48:40 There's lots of opportunities now because an open page is that you can go on Facebook, don't tell Mark Zuckerberg, under a fake name and you can post and people won't know it's you and you can find groups about people that are supporting you. I mean that was one of the things I did when, when my husband first died, I basically stayed in bed and watch DVDs, but I would go on Facebook and I would find people that were struggling in one way or another and I would write supportive comments and I'm still facebook friends with some of them today because it was, if you're thinking about somebody else, you're not thinking about yourself for a minute. So that was really important to me, but I could do it in bed. If you're, if you're 60 or 70, you probably have a reason. But if you're young you just really don't. I so sad to me because you don't know what's going to happen next and it could be lovely. Heather Stang: 49:42 So, I want to talk to you forever. I really do. Keep going forever. And I think people could probably listen to you forever because again, you are just very authentic and that's what we need more of that in the grief world is just the truth of it all. And so I'm really grateful for that. And so if people want to join your Facebook group, read your book, where do we find you? Tell us more about you. Jan Warner: 50:21 Well, the Facebook page is ww. I'm closing my eyes. I have to close my eyes to think, www.facebook.com/griefspeaksout, and you don't have to join. You're welcome to check that you're a follower, but if you just want to hang out and not have anybody know that you're there, that's fine with me. I don't do this in order to get likes, etc. and so forth. I do it to support people. I have my blog, I don't write for it anymore, but it's still exist at www. Griefspeaksout.net, but it's really strange if you don't put the www in you won't get it, so I have not worked that out yet. The book Grief Day by Day: Simple Practices and Daily Guidance for Living with Loss, not my title. I would have made a shorter one so its easier to remember, by Jan Warner, that's me. I do "That's me" because I'm still like, ah! I wrote a book. It's available at Amazon in the United States, in England, Australia, and Canada, and it's available at barnesandnoble.com and in selected Barnes & Noble stores and also if you Google it, it's been out for over a month, so starting to float around in different places. If your library doesn't have it, you can ask them to order it. You can email me at eyeseepic@aol.com. If you're having trouble getting it because I'm perfectly willing to send your library copy if they don't want to order it. Heather Stang: 52:06 Oh, that's lovely, and I imagine people can also check your local bookstore might be interested in picking it up as well, so you might want to go there and special order it. I know I'm going to certainly go down to Curious Iguana in Frederick who's my favorite local bookstore and say, you know, this is a good one because again, the way it's organized, it's easy to read. You can jump around. You can also do the Bible Dip, you know where you just pick it up and flip it open and see what's there for you. That might be just incredibly inspirational and I will have all of that information for you who are watching or listening. You'll either see it on the screen if you're watching it, if you're listening, you can go to mindfulnessandgrief.com/podcast and it will be in the show notes along with some of Jan's beautiful words that she's shared with us. Jan Warner: 53:32 And the hospice because your entries would be a really nice way to just open a grief group and read a little bit, read one of the entries from that, and that can really guide a discussion about I think, what are universal experiences in a very unique and personal experience. That's the paradox of grief isn't it..
Jan Warner: 53:58 Funeral directors. I mean there's all kinds of places that it can be of help to people. When I wrote it, I was afraid to look into it because I thought what if it's not good? Luckily I was wrong. I'm, I really am humbled and it wasn't a gift I asked for. We were talking about something earlier where the great irony is is that I have this big footprint because my husband died and what I really want to do is share it with my husband and I can't, so I'm still a little startled by it, but I'm very, very grateful that people have called it things like a soothing balm for a wound or an outstretched hand in friendship that people, because grief is so devastating that I can provide any kind of comfort at all to people is just, I can't take it in as you saw. I'm rarely speechless. It makes me speechless. Heather Stang: 55:03 Well, and, and as with all of us, I wish we didn't even need to be here. But we are here and you are doing good work and helping a lot of people, me included, and it is a really good book and I'm not just saying that I read a lot of grief books, many of which wind up in a pile that don't ever get mentioned again. because they're too bossy or rooted in a myth rather than reality. And yours is very real. And so thank you for putting that out there. And again I'm for you listeners, it's Grief Day by Day by Jan Warner, and just to close us out, would you like to offer any well wishes or words of advice to our listeners as well? Jan Warner: 55:51 Well first of all, thank you also for the work that you do at the time that you spend doing it. Thinking of Mr. Rogers saying, look for the helpers. There are a lot of people right now that are grieving in so many different ways for so many different things. So when everything seems really dark and black, either people you know or people online that just - Mother Teresa said, if you want to Save the world, go home and love your family. So look at the things that make you feel safe, not afraid. Think of all the moms that are in the playground with their children. Think of the people. I have a friend that teaches gender studies in Iraq and she has military men on a video talking about how they respect their daughters and their daughters are just as important as their sons. So all over the world there are people doing small everyday things and people doing big everyday things that are caring and loving and there's no news alert about them. So you look for them yourself and you say, yes, I'm really upset about A, but wow, look at B and what those people are doing. Heather Stang: 57:16 That's beautiful. Filling your world with the good. Heather Stang: 57:21 Thank you Jan. I'm so grateful for your time and for your heart. Thank you. Jan Warner: 57:27 Thank you. Heather Stang 57:32 Thank you for joining us for the Mindfulness & Grief podcast. If you found the information helpful, please help others find us by rating, reviewing or subscribing to this podcast, wherever you download your favorite shows for additional grief support, including free guided meditations, visit us on the web mindfulnessandgrief.com, and consider adding the Mindfulness & Grief book to your self care tool kit. Special thanks to our sound engineer, Todd Campbell of Hub City Recording and to the Atomic Mosquitoes for our theme music. I'm Heather Stang and I hope these teachings will be of great benefit to all who received them. Until next time, namaste. Heather Stang, M.A. is the author of Mindfulness & Grief. She holds a Masters degree in Thanatology (Death, Dying, and Bereavement) from Hood College in Maryland, and is a certified Yoga Therapist. She has led mindfulness-based grief workshops for organizations such as the National Fallen Firefighters Association and Hospice of Frederick County, and is a member of the Association of Death Education and Counseling. Heather’s mission is to help people who are grieving to stay healthy and benefit from the transformative experience of grief, using mindfulness-based practices, relaxation, and expressive arts. She has an established practice offering Phoenix Rising Yoga Therapy sessions, day-long retreats, and 8 Week Yoga for Grief groups. She is based in Maryland. You can find her on Google +.